I like pretty pictures. I would like to take pretty pictures. I mentioned in my recent post about being artistic that this a relatively new interest of mine. I developed this interest partly because I started this blog and I obviously need photos for it and partly because I was not completely satisfied with some vacation photos I had taken. I knew what I wanted but I didn't know how to achieve it. I still don't really but I am doing a lot of reading and a lot of practicing and one of these days I might end up with some photos I am reasonably pleased with. 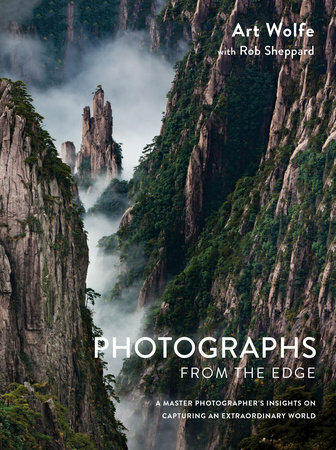 Photographs From the Edge by Art Wolfe is one of the books I have been reading lately. Because I have only recently started paying attention to photography I was not familiar with who Art Wolfe is. I have a feeling I should have been. Apparently, he is a celebrated nature/wildlife photographer and his work has appeared in such publications as Smithsonian and National Geographic. This is just one of many books he has written. I see why he is so well-known. His photos are gorgeous. He takes you on a journey around with world with everything from a yak train in Tibet to penguins in Antarctica to the alps in France. The photographs span many years of his career. One thing I appreciate about the book is that is so accessible to someone like me who does not really know much about photography but would like to learn. Each photo has a segment by Wolfe about the photo itself, describing what was happening around the taking of the photograph. Under the photo title it also lists the equipment he uses. Then there are two other little headings. One is called "The nature of the photo" which is exactly what it says, a small blurb about the animal, location, etc. that you are looking at. The other is called "Photo tip" and provides easily understood pointers for the reader. I enjoyed that not only is this a book full of gorgeous photos but it is also a way to learn a bit more about the photography process. My one quibble with the book is that frequently the photos are smaller than I would like. The text takes up quite a bit of space and then there is a surprising amount of blank space on the pages. I think the impact would have been more impressive if the photos were larger. After all, they are the star of the show. This is a book that I am sure I will pick up and browse through with fair regularity. It is not a book to be read cover to cover in one sitting but it is one to be flipped through and enjoyed. It will bring a bit of beauty and a bit of the natural world into your everyday life. This book sounds like something I need. I would love to take better photos, mainly so that I can take better photos for our vacations, but also for my blog. Before I went on my honeymoon, I watched a bunch of videos about taking better photos, but it didn't really stick. I think I am the type of person who needs to read to learn so I will be checking this book out. Thanks! I found this book to be a very good source of inspiration and it taught me a bit about the thinking behind how a photo is set up. It isn't an instruction manual though. I watched a whole ton of videos too and I agree, they didn't stick. Now I am looking for a book to teach me the practicalities of photography. One day I will have gorgeous vacation photos! This book looks lovely. I like that it gives some insight as to how the images were created. As an amateur photographer, a lot of the times I find myself wondering, "How did they do that?" That is exactly how I feel. This isn't a technical book but it does tell you what was going through the photographer's head when he took the photo. I felt that it brought the photos to life a bit more. Ooooh, this sounds very good but I agree with you - large photos sound like they would work better with a book like this. Good luck with your photo journey - when I started my travel blog in 2008, my photos were more than slightly rubbish! They definitely improve with practice (I hope). I found your blog through Carolann's linkup. Hi! Thanks for stopping by and saying hi. I know what you mean about rubbish photos when you start blogging. Mine still are but I am slowly, slowly improving and I am having fun in the process. Wow, you have been blogging since 2008? That is a long time. I am impressed.